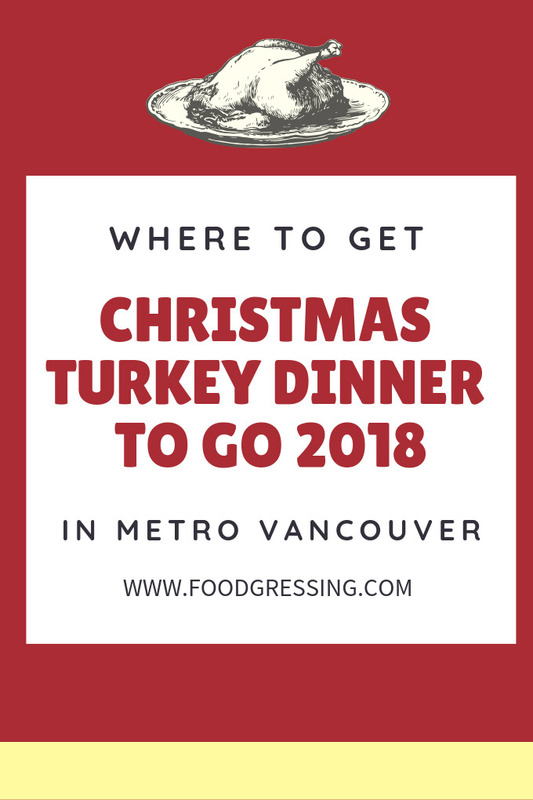 If you want to leave the Christmas cooking to someone else this year, here is a list of places in Metro Vancouver that are offering Christmas turkey dinner to go this year. I have not included images as this list is designed for you to obtain quick information on what is being offered and compare the options. Please check with the restaurant for the most up-to-date and accurate information on dates, times, prices and menu offerings. This list is updated as information becomes available. If you are a restaurant and want to be added, please contact me at foodgressing@gmail.com. Railtown Catering $319 (8 - 10 ppl) Pre-carved 16-lb sage-roasted turkey, traditional giblet gravy, a variety of festive side dishes, and classic pecan pie for dessert. Available for pickup between 10 a.m. and 5 p.m. at Railtown Cafe (397 Railway Street) in Vancouver on Monday, December 24, Tuesday, December 25 and Wednesday, December 26, or by delivery for an additional charge. Hot ‘Ready to Eat’ packages are also available for an additional $50 and will be available for pick up only between 3 to 5 p.m.
Juke Fried Chicken $169 (6 - 8 ppl) Pre-sliced turducken with stuffing and gravy, large sides of fried Brussels sprouts and herb-roasted potatoes, cranberry sauce, honey roasted squash, and country biscuits with whipped schmaltz. Order by emailing info@jukefriedchicken.com before noon on Thursday, December 20. All orders will be ready for pickup at Little Juke (1074 Davie Street) from 11 a.m. to 6 p.m. on Sunday, December 23.